Lessons learned from this one: (1) Gnocchi can be pan-fried, instead of boiled, and (2) field greens can stand in for baby spinach, in a pinch, but aren’t quite as good. Anything advertised as a “30-minute meal” always takes me longer, so I’ve listed this as a “45-minute meal” — your results may vary, depending on your chopping speed. In any case: gnocchi, ground turkey, beans, tomato, basil + spinach — with a beat of heat from some red pepper flakes — made for a fast and very satisfying one-pan meal that was even better for lunch the next day. Heat a glug (1-2 tsp) of oil in a large skillet over medium heat. Add the ground turkey and cook until browned and cooked through. Set aside. Add another glug of olive oil to the skillet. Add the gnocchi to the pan, separating them, and sprinkle with salt, pepper and half the red pepper flakes. Cook for 4 minutes until they start to get golden and a bit crispy, then stir them around and cook for another 4-5 minutes, stirring occasionally, ensuring they don’t burn. Test one out to make sure it’s cooked through, and then remove the gnocchi from the pan. Add another glug of olive oil to the skillet. Add the sundried tomatoes, tomatoes and white beans. 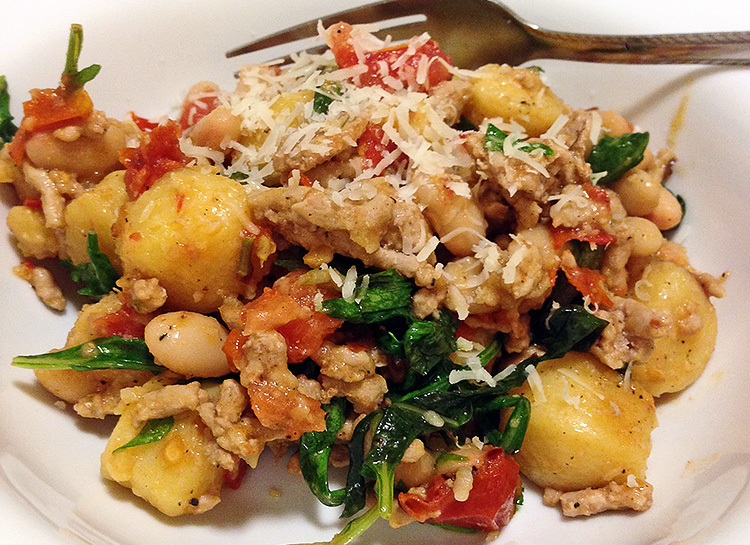 Cook for 2-4 minutes, then add the turkey and gnocchi back into to the skillet, along with the spinach and basil. Stir until the greens are wilted and everything is heated through. Add additional salt and pepper, the remaining red pepper flakes, and possibly another teaspoon of olive oil, to taste. Serve with a sprinkle of freshly grated Parmesan cheese. * You could easily just omit the turkey to make this a vegetarian dish. The original recipe actually called for mushrooms, instead. ** I’ve now tried this with both “dried” off-the-shelf gnocchi, and gnocchi from the refrigerated pre-made pasta section of our local Wegmans. Both worked fine.